This authoritative analysis introduces the key concepts used by contemporary political scientists. Rigorous, concise, and tightly argued, it makes use of everyday and historical examples to illustrate important and challenging conceptual material.Uses the core political phenomenon ofinfluenceas a springboard to explaining politics, government, state, political systems, democracy, and the like. Explores the democratic political system and what has been learned about the conditions that facilitate or undermine democracy. Is updated throughout to treat recent developments in world events and political analysis. Discusses the important differences between democratic and nondemocratic systems.For anyone interested in learning more about how political systems and governments work. This sixth edition of Modern Political Analysis appears more than a decade after its immediate predecessor and in the early years of a new century and new millennium. 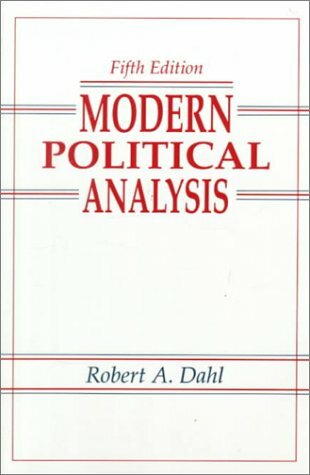 Notwithstanding the passage of years and accompanying political events—of which the audacious terrorist attacks of September 11, 2001, are surely among the most prominent—this new edition of Modern Political Analysis reaffirms enduring perspectives on the nature of politics and how contemporary political scientists analyze it. Even so, this edition, marked by the addition of a co-author (Bruce Stinebrickner) to work with the original author (Robert A. Dahl), reflects a thorough revision of what has gone before. Our treatment of influence and the nature of politics in Part I has been substantially revised and reordered to make it more easily grasped by student readers. Chapter 1 describes people in different situations of influence, ranging from those with virtually no influence over others to enormously powerful figures like Hitler and Stalin. Only after these historical accounts in Chapter 1 do we treat in more abstract fashion the central concept of influence and its relationship to politics and associated phenomena in the remaining four chapters in Part I. The four chapters that constitute Part II treat similarities and differences among the world's political systems and generally parallel the approach used in the fifth edition. However, the demise of the Soviet Union since that previous edition has reshaped the political landscape in a large part of the world and significantly increased the number of sovereign states on this planet, all of which is reflected in relevant tables and figures presented in Chapters 8 and 9. Yet our analysis in Chapter 9 confirms that earlier editions' overarching approach to the factors that facilitate democracy in national political systems has stood the test of time. In this context, we wish to thank Sunil K. Sahu, a colleague of Stinebrickner at DePauw University, and Michael Coppedge of the University of Notre Dame, a former graduate student of Dahl at Yale, for their help in revising various sections of Part II. Professor Sahu suggested many bibliographic and data sources relevant to our analysis in Chapters 6 through 9, while Professor Coppedge provided insights that assisted in the construction of the "polyarchy index" that underlies Figures 9-1 and 9-2. The two chapters that make up Part III have both been substantially revised, but in different ways. While the outline of the analysis of political participation in Chapter 10 is largely the same as in the fifth edition, we have refined and streamlined the argument in several respects and updated the bibliographic citations in light of relevant research that has become available since the fifth edition. We would be remiss not to mention our mutual friend David R. Mayhew of Yale University for his assistance in pointing us to recent important research on political participation. Professor Mayhew was Stinebrickner's Ph.D. dissertation advisor at Yale in the 1970s and is a longtime departmental colleague of Dahl, and both of us are grateful to him for his characteristically knowledgeable and timely help. Our revision of Chapter 11, which treats political evaluation, is an attempt to simplify and clarify the arguments) so as to make the main points more accessible to student readers. We conclude the book in Part IV by blending old and new material in a new chapter entitled "What Good Is Modern Political Analysis?" In that chapter we incorporate recent work by political scientists suggesting how political science can and does have applicability and relevance outside the academic world. We would also like to thank the following reviewers: Michael C. Downs, Indiana University-Purdue University; Clarissa Peterson-DePauw University; and Robert Price-University of California, Berkeley. Before we sent our manuscript to Prentice Hall, Kelsey Kauffman undertook to read and reformat the entire draft. Her fresh eyes caught a number of errors, and we would like to thank her for her timely editorial assistance. We are painfully aware that on everything said in this book there is much more to be said. From the first edition to the present, however, Modern Political Analysis has been intended to be a short book. It would have been much easier to write a longer one. To keep the book close to its original size, when adding new sections we have usually deleted old ones. No reader will, we hope, regard this book as more than an introduction to a world of experience as complex as it is fascinating.